The first of a proposed trilogy about the legendary world conqueror Genghis Khan, the exotic swords and snowboots saga Mongol is less historical epic than slice-’em-up cowboys and warlords. Directed by Russian filmmaker Sergei Bodrov (Prisoner Of The Mountains) with wild early macho gusto, this raucous retro-travelogue with its visceral compilation of bloody battle scenes, never quite seems to penetrate the unique spirit and character of this population landlocked between Russia and China. 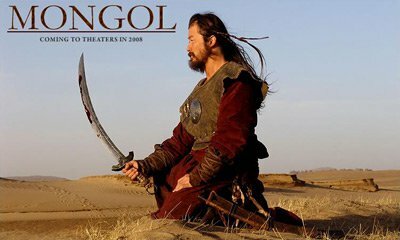 When Mongol begins in the 12th century, Genghis is a determined young boy nicknamed Temudgin. Pestered by his mom to select his future bride from a lineup of clueless little girls, Genghis reveals his precocious inclination as a leg man when he chooses roughneck pigtailed Borte (Bayartsetseg Erdenbat), because ‘strong limbs make a man happy.’ Making a solemn promise to return to fetch her in five years, the presumed age of consent back then, Genghis (Japanese star Asano Tadanobu playing him as an adult) takes off for parts unknown in the vast wilderness, where he falls through a lake, wards off fierce tribal enemies, is repeatedly kidnapped and at one point stuck in a cage at a slave auction. Mongol is more impressed with its own olden days ready-to-rumble attitude and flesh-ripping Far Eastern beatdowns, than fleshing out with any depth or reflection just who these characters were and how they struggled to exist back then. History as a scenically breathtaking but dramatically sparse guided tour.